Hooked Up Mural Decal. Fly fishing is a skill that many outdoorsmen and women possess. There's nothing quite like a fish rising to meet your fly. 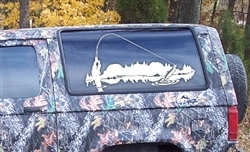 If this is your passion then we have the decal just for you. This is our 22" X 11" Mural size. Larger sizes available on request.